Lunch Picker 3.0.1 is food & drink software developed by Ignyte Software. Lunch Picker is designed to save you or your work staff the endless discussions over where to eat lunch. It has a payment option that tells Lunch Picker to only choose restaurants that accept certain payment types, it allows you to select restaurants that are within a certain price range, and it allows you to assign cuisine types and limit the available restaurants based on cuisine types. This home & hobby software is shareware, which means you can download and use Lunch Picker 3.0.1 for free during the trial period (usually for 30 days). At the expiration of the period you will have to buy the food & drink product for $4.00. Lunch Picker 3.0.1 is available at regnow and Ignyte Software website. 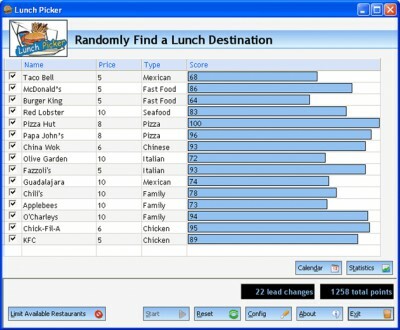 Lunch Picker 3.0.1 supports English interface languages and works with Windows XP/Vista. We have tested Lunch Picker 3.0.1 for spyware and adware modules. The software is absolutely safe to install. Our website has thoroughly tested home & hobby product Lunch Picker 3.0.1, written the review and uploaded installation file (408K) to our fast server. Downloading Lunch Picker 3.0.1 will take several seconds if you use fast ADSL connection. Cuisine is the ultimate recipe manager for Mac OS X.
DockAlarmTheClock is an alarm Dockling to remember you to go to lunch, or home, or go to work.